A crosstalk between cancer and immune cells is established during cancers. The immune system is able to fight against tumour cells (see my previous post “Immunosurveillance: Crosstalk between cancer and immune cells”). But what happens when immunosurveillance fails? This is the subject of this new post. A selection of validated immunoassays allowing you to monitor cytokines and signal transduction biomarkers involved in these “loops” is also introduced. Tumour escape involves many potential steps, including loss of expression or alterations of immunologically recognized Tumour Associated Antigens (TAAs), decreased expression of NK and/or CTL recognized activation markers or increased expression of cytolytic inhibitory markers (NKG2D, MHC I, KLRG1, CTLA4), secretion of immunosuppressive cytokines (TGF-β, IL10), or recruitment of immunomodulatory cell populations to the tumour microenvironment (cancer-associated fibroblasts, monocyte-derived suppressor cells). Immunologic pressure on the growing tumour selects for increased survival of those cancer cells expressing fewer TAAs on surface MHC molecules, leading to poorer recognition by immunosurveying T cells. Reduced antigen recognition can lead to reduced cytolysis by CTLs and NK cells, but also reduces IFN-γ expression that normally promotes local inflammation and differentiation of M1 Mφs. Increased tumour cell shedding of MHC homologues can block NKG2D mediated NK cell activation, further masking the tumour cell from the innate immune system. Coupled with surface expression of CTLA4 and PD-1, molecules with known immunosuppressive functions, the tumour cell can directly interact with cancer-specific T cells and quell their cytolytic and/or cytokine-driven anti-tumour functions. Finally, reduced surface expression of the apoptotic receptors FAS and TRAIL-RI/II on the tumour surface can make the cell much more resistant to these cell death signals, especially when coupled with increased Bcl-2 or Bcl-xL levels or decreased Bim levels, together allowing the tumor to survive, evade, suppress, and even extinguish the anti-tumour response. Normal cells may become nascent tumours by evading tumour suppression after carcinogenic mutation and/or apoptosis that would normally result from gross chromosomal changes. Pro-inflammatory and pro-angiogenic factors can help to establish blood supply for the growing nascent tumour. Activation of the adaptive or native immune response can eliminate the nascent tumour, the tumour may remain in equilibrium as an occult tumour, or the tumour may escape immunosurveillance to create a viable tumour-supportive microenvironment. Innate and adaptive immune responses may still work to eliminate the tumour via immunosurveillance. Tumours may also metastasise to move to another location; this may be an additional mechanism of avoiding immunosurveillance by evacuation of the “hostile” TME. 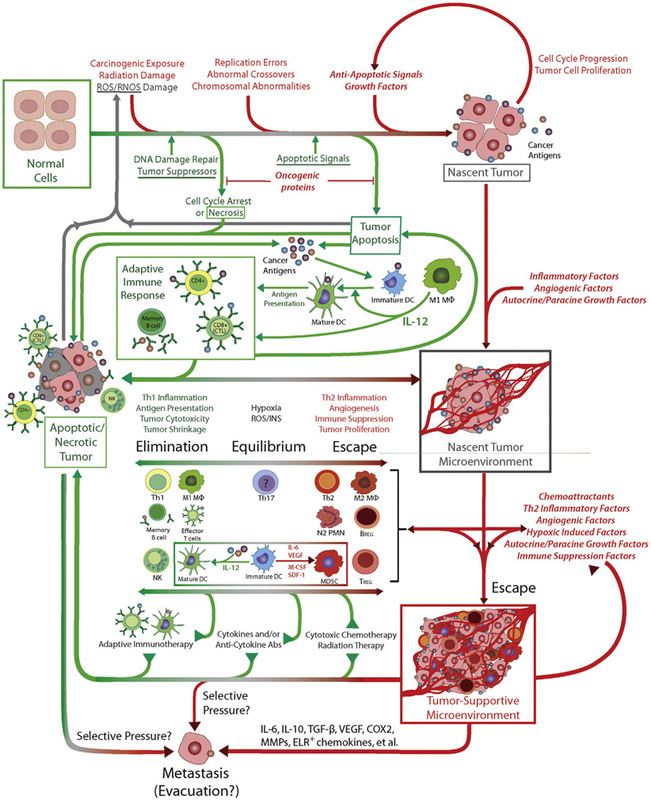 In the above figure, green colour denotes processes potentially leading to tumour eradication, while red colour means promoting tumour escape and progression. In our last post in the series, we will focus on how the tumour recruits accomplices helping it to grow and disseminate. By knowing the molecular mechanisms behind this process, youcan better understand how to fight to prevent this from developing a cancer. Thanks again to Jarad Wilson from Raybiotech, Inc. for his help. Looking for validated immunoassays to analyse tumour crosstalks? Please do not hesitate to leave a message below.